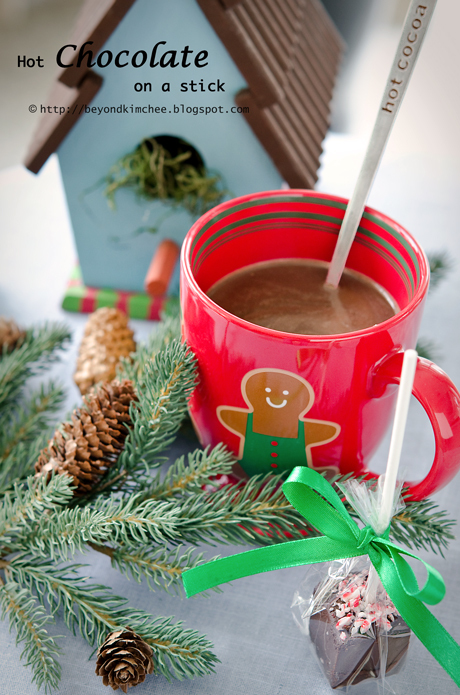 Have you ever tried hot chocolate on a stick? I had this delicious hot chocolate for the first time in a small bed and breakfast in Brugge, Belgium a couple of years ago. I’ve always thought that hot chocolate is coming from the powdered mix where you just add hot water, which, of course, is still good and convenient. Then, I had tried this stick version of real chocolate melted in hot milk. It was so good that I would never wanted to go back to one of those packet kinds. 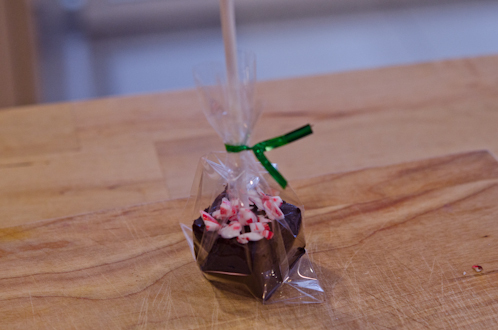 With rich and creamy chocolate flavor, it makes wonderful gift to anyone. Besides it is quite easy to make, and you can freeze them for later use. 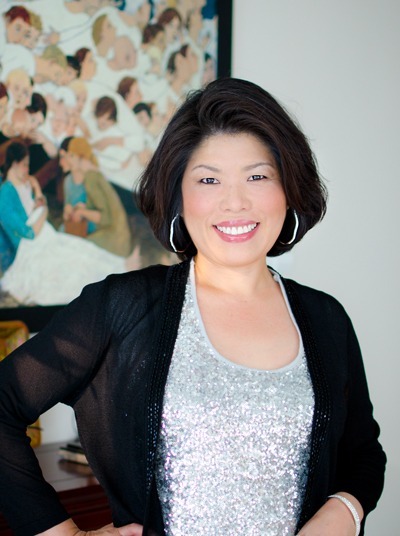 How perfect it is for the gift giving season! 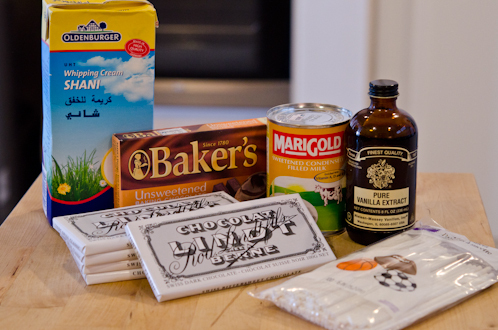 Heavy cream, bitter sweet chocolate unsweetened chocolate, sweet condensed milk and vanilla. You will also need some sticks. I used lollipop sticks but Popsicle sticks works well, too. 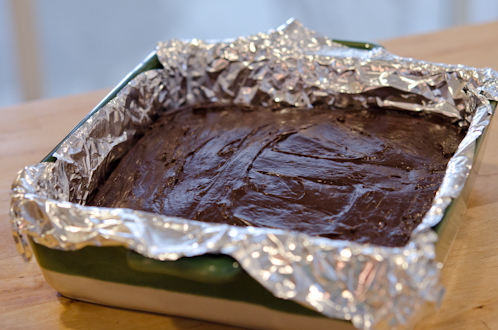 First, line 8″x8″ pan with foil and set aside. 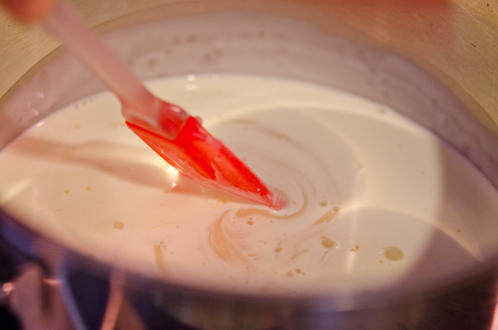 Combine cream and condensed milk in a pot and simmer over low heat until steaming. 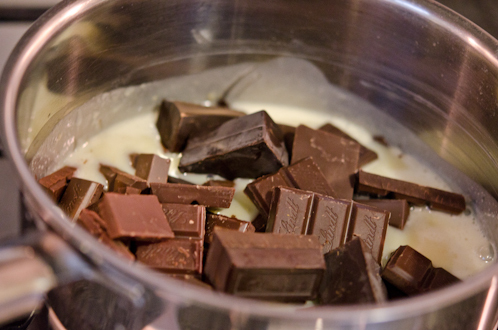 Add chocolates to the pot, remove the pot from the heat and let them melt in the milk/cream mixture. Bring the pot to the heat again and start whisking the mixture vigorously. Add vanilla and continue to whisk. 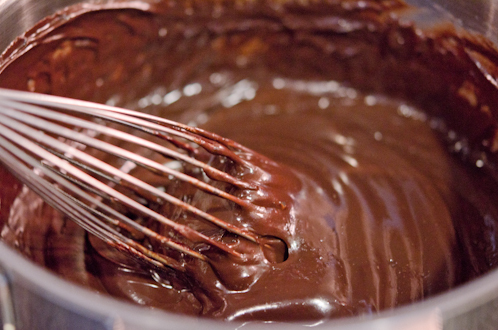 Thick and shiny, the chocolate batter is ready to pour. Pour in the foiled pan and let it set to firm up overnight or 3-4 hours in the fridge. 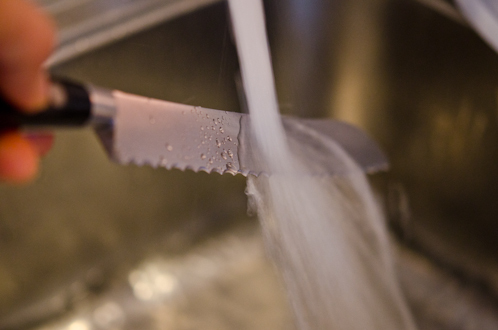 Rinse your knife under the hot water to warm up the blade. and wipe on the cloth to dry. You need to repeat this on each cut for the smoother edges. Cut 5 or 6 on each row and columns,which makes 25 or 36 blocks. Although I did cut mine 6 rows and 6 columns which made 36 pieces, I recommend to cut 5s to make 25 pieces. This will increase more rich and chocolaty flavor in your hot cocoa. This is an optional. 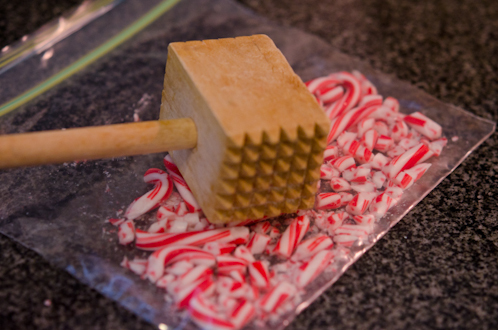 I crushed some candy canes to sprinkle on top of blocks. 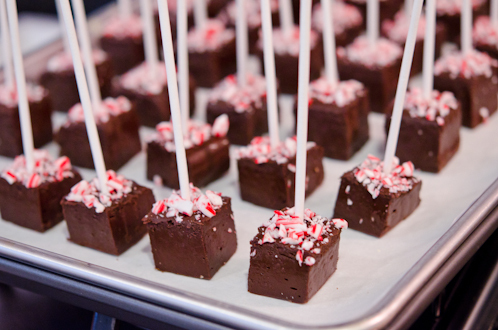 Insert sticks in your chocolate blocks and sprinkle some crushed candy canes to make festive look. You can store these on the room temperature for 1 week, 2 weeks in the fridge, and 1 month in the freezer. I put mine in the small cellophane bags for gift giving. It makes wonderful gift in a cold season. To make hot chocolate with these blocks, heat a mug of milk, about 6 oz (3/4 cup), and add one stick and let it sit for a minute to soften, and stir to dissolve completely. Do not use water. It won’t taste right. and I can feel the merry spirit. 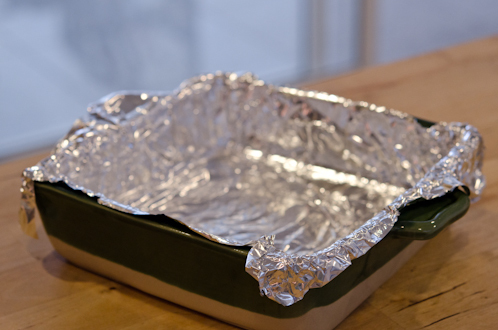 Line 8"x8" pan with foil and set aside. 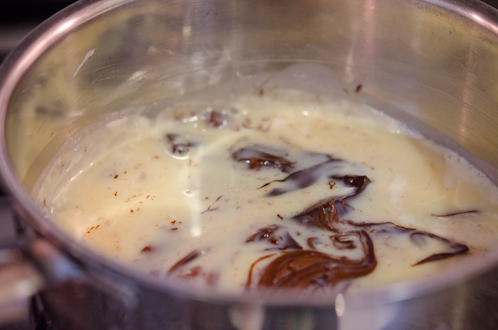 Heat cream and condensed milk over low heat until steaming, remove from heat and add chocolates to melt. 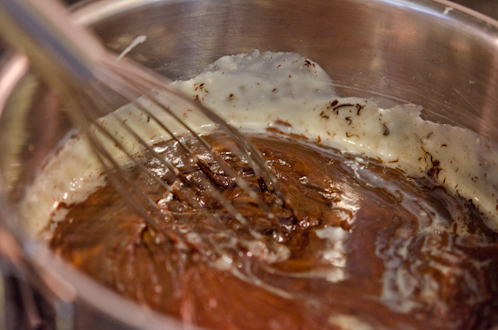 After 10 minutes return chocolate to low heat and whisk until the mixture is thick and shiny. Add villa and stir well. Pour the mixture over to the prepared pan and let it sit overnight in the roo temperature or in the fridge for 3-4 hours to firm up. 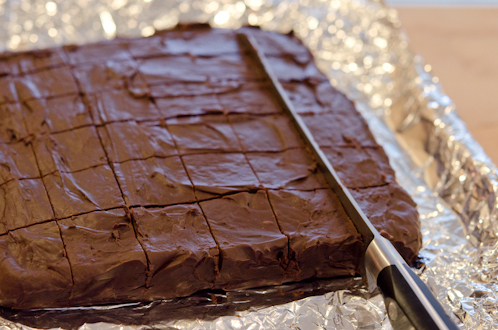 Take your chocolate out of pan on the cutting board. 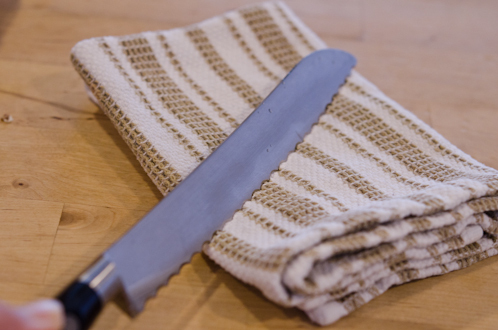 Heat your knife in the hot running water t and wipe out with dry cloth before each cut. Cut into 5 rows and 5 columns to make 25 pieces. Insert the sticks in the center of each block. Wrap in a plastic wrap or waxed paper to store. They can be stored for 1 week in the room temperature, 2 weeks in the refrigerator, and 1 month in the freezer. To serve, heat 6 oz milk in a mug and add one stick. Let it sit 1 minute to soften, Stir vigorously to dissolve completely with a stick or a spoon. Enjoy! I hope the chocolate sticks turn out well for you. You have a wonderful Christmas, too! What a wonderful post! Really great idea - I love it. 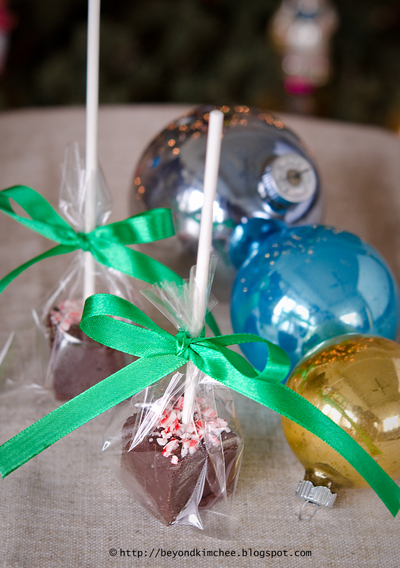 Although those "lollipops" look so good I don't know if they'd make it to the hot milk! Anyway, thanks for a fun & seasonal post. Happy Holidays! What a beautiful and festive post!! Merry Christmas to you and your family! Thanks, Hyosun. Merry Christmas to you, too! Hi Holly, Thanks for the recipe. I was wandering where did you bought your vanilla extract? 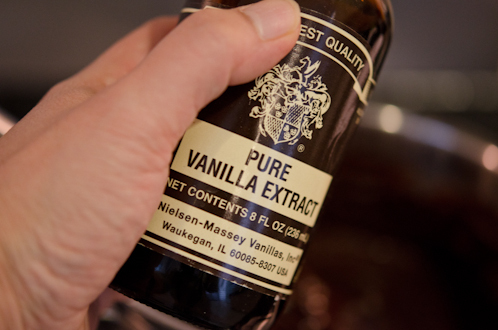 It very difficult to get a good/pure vanilla extract. 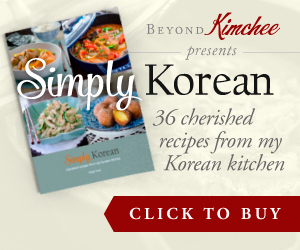 I think I bought mine at the specialty food/kitchen store in VA , William-Sonoma if I remember right. Hi Holly,I am in Korea and someone gave me a chocolate heart.The texture was that of tok (soft) but it tasted soft and chocolaty.My friend said that the person probably used only cacao powder and condensed milk to make the chocolate hearts.Do you know of such a recipe because the chocolate heart tasted really divine. Hard to tell unless I have tried. But this stick version of hot chocolate is good to eat as is since it has cream and sweetened milk in it. 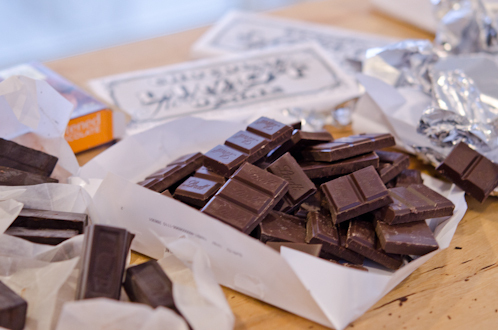 Just pour over any shaped mold you desire, and you got your chocolate ready to go.